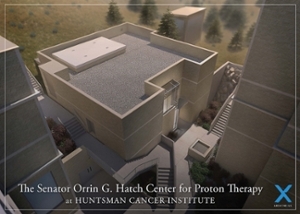 SALT LAKE CITY – Today officials at Huntsman Cancer Institute (HCI) at the University of Utah (U of U) began construction on a project that will house the region’s first proton therapy center and announced the new center will be named in honor of United States Senator Orrin G. Hatch. Cancer patients and loved ones joined leaders from HCI, Huntsman Cancer Foundation (HCF), and the U of U to mark the occasion. The $31 million, 7,450 square-foot addition to the south end of HCI’s Cancer Hospital will be the first proton therapy center in the Mountain West. Proton therapy is a type of radiation therapy, a cancer treatment that delivers beams of radiation to shrink a tumor. Approximately half of all cancer patients receive some type of radiation therapy as part of their cancer treatment. Proton therapy delivers a specialized type of radiation and is the favored approach for many tumors in and around vital structures, such as the spinal cord and brain stem. It is also the preferred treatment for certain childhood cancers. The naming of the center was provided by a $10 million gift from HCF. “Senator Hatch has been a steadfast supporter of Huntsman Cancer Institute since day one,” said Peter Huntsman, chairman and CEO of HCF. “Senator Hatch’s support completely changed the landscape for cancer care in our region. Thus, we think it is most fitting to name in his honor this new center that will provide a critical new resource to patients in our region.” Zions Bank also provided a contribution to the naming of the center. Currently, the proton therapy centers nearest to Salt Lake City are located in southern Arizona and southern California, approximately a 10-hour drive away. Patients who are given proton therapy may need a treatment course that occurs five days a week and spans four to eight weeks. The new center will provide an opportunity for Utah to participate in advancing research and training related to radiation therapy. “We are grateful for the decades of support Senator Hatch has provided to cancer research and care and are enthusiastic about innovative treatments made possible in this facility,” said Ruth Watkins, U of U President. The center is projected to serve up to 200 patients a year when it is fully operational. “The Senator Orrin G. Hatch Center for Proton Therapy will be the first of its kind in the Mountain West. It will augment the therapies already available at HCI and provide the newest radiation technology to patients from Utah and the surrounding region, many of whom now travel out-of-state to receive this treatment,” says Dennis Shrieve, MD, PhD, HCI radiation oncologist and professor and chair of radiation oncology at the U of U. It is anticipated to begin treating patients in fall 2020. Watch a recap of the groundbreaking.